BIBLICAL ANTHROPOLOGY: Are Rabbinic Interpretations of the Bible Accurate? Are Rabbinic Interpretations of the Bible Accurate? A great deal of misunderstanding can result from the mechanical reproduction of previously published ideas either because those ideas are taken out of context or because they are based on factual errors. The manner in which authors sort and select data, without verifying the source or checking the facts, can lead to distorted interpretations. This problem must be anticipated in Bible interpretation where it is common to rely on what the rabbis have written. 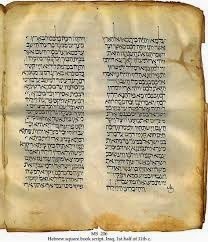 As the Bible is viewed as a Jewish religious text, it is natural to seek rabbinic guidance. American Christians tend to read the Old Testament through rabbinic sources. Many seminaries and pastors use commentaries written by non-believing Jews. This is especially true among American Evangelicals. They appear to be unaware of the antecedents of Messianic expectation among Abraham's Nilo-Saharan and Saharo-Nubian ancestors. They also are generally unaware that Hebrew is an African Language. And Psalm 110: 4. The Rabbinic community has made many inflammatory accusations against the Christian interpretation of this verse. But if David wrote the psalm, then Jesus' question is well considered: If the Messiah is merely David’s son, as was universally agreed, how can David call him his Lord? If David wrote this, what was his source? He believed in the coming of Messiah based on his Edomite heritage. Edom was where the Horite kings ruled and where Abraham's territory extended between Hebron and Beersheba. The Horites had long expected a Righteous Ruler to overcome death and lead His people to immortality. They were a caste of ruler-priests who were devotees of Horus and his mother Hathor-Meri, the patroness of Horite metalworkers. It appears that David drew on Horite tradition. His father was a great Horite ruler whose territory extended from Bethlehem in Galilee to Ramah. Ramah was the home of Samuel's Horite father. It was Samuel who anointed David in Bethlehem and for a time the Ark rested in Bethlehem. The Bethlehem of Obed, Jesse and David is specifically associated with the Horites in I Chronicles 4:4 which names Hur (Hor) as the "father of Bethlehem." David's sons are called "priests" in II Samuel because they were of the Horite ruler-priest bloodline. This is Jesus' bloodline through Mary. It was universally agreed that the Messiah was the "son" or descendant of David, and according to the prophet Micah He would come from Bethlehem, David's royal city. Bethlehem of Galilee was known as a fruitful place and therefore called Bethlehem "Ephratha." This is the Bethlehem of David's ancestors Ruth and Boaz. It was a region known for fruit and grain. It was connected to the royal house of Tyre. Tyre was one of the ancient seats of wisdom. Hiram I of Tyre helped David build his palace. Tyrian craftsmen also helped Solomon build the temple. The rulers of Tyre were considered to have roots in ancient Eden. How can David's son/descendant also be called David's Lord? This was the riddle that Jesus posed to his disclaimers. The ruling Jews rejected Jesus as Messiah and the division took place when our Lord was manifested at His Baptism, in His Galilean ministry, and during His passion. He fulfilled all the signs of Messiah: feeding the people, calming wind and waves, healing the lame, giving sight to the blind and raising the dead, yet the ruling Jews refused to believe. They rejected the tradition of their own Horim (Horite ancestors) who knew that the ultimate sign of Messiah's identity would be an empty tomb. This is why Abraham's ancestors were buried with such care and their tombs sealed. They believed that the salvation of the people depended on a Righteous Ruler, who having overcome death, could led his people to immortality. The third-day resurrection was regarded as the most definitive sign whereby Messiah would be identified. The Jews knew this and therefore took great precaution to see that Rome sealed the tomb and posted a guard. The Jews have spun a myth that Abraham was the first Jew. This is historically, anthropologically and linguistically inaccurate. Even Shaye Cohen, the leading Jewish scholar at Harvard, admits this in his interview with NOVA. To avoid the reality of Abraham's Nilo-Saharan ancestors, the rabbis begin Jewish history with the calling of Abraham. But it just doesn't work. Since Abraham was Habiru (Hebrew) and not a Jew, the central narrative of Judaism shifted to Moses and we came to think of Israel as having two different origins. However, Moses' family was Horite. That has been confirmed through analysis of Amram's marriage and ascendancy, which is distinctively Horite. The prophets were right to condemn Egyptian polytheism. The Horites were not polytheistic. They believed in a single Creator whose son was Horus and they spoke of the Father and Son as equals. So it is that Christianity emerges from a tradition much older than Judaism. In this sense, the core of the Christian faith is the oldest known religion. It took the Apostles a while to sort this out since they were brought up in post-exilic Judaism which is very far from the faith of Abraham and his Habiru ancestors. However, after the Resurrection, the Apostles recognized Jesus as Messiah and began to insist that unless one believed that He is the Son of God one cannot be saved. From that point, the division of Christianity and Judaism was inevitable. Rabbinic animosity toward followers of the Christ intensified after the destruction of the Temple, for which Christians were blamed. The Sanhedrin relocated to Jamnia and from there the campaign to paint Jesus as a fraud began in earnest. When we consider the Horite beliefs concerning the Righteous Ruler we find close parallels. His mother was to be overshadowed. Because her animal totem was the cow she is shown in Nile temples holding her infant child in a stable. A Horite ceremony involved the priests bringing gifts and setting them before the Child. Another ceremony involved two days of mourning for the death of Horus and on the third day the priests cast grain into the fields as a sign of new life. When telling his disciples of His impending death, Jesus identified Himself as Seed or fallen grain in John 12:24: "Truly, truly, I say to you, unless a grain of wheat falls into the earth and dies, it remains alone; but if it dies, it bears much fruit." Here we find the words of David in Psalm 110:1 - The LORD says to my Lord: "Sit at My right hand until I make Your enemies a footstool for Your feet." Ultimately, the great divide centers on the question Who is Jesus? The rabbis have not been open-minded on this question. They have given ignominious names to Mary and her Son. In the Talmud Mary is called "Charia" which means dung or excrement. Yet they grant that she was of the ruler-priest lines. Sanhedrin 106a say, “She who was the descendant of princes and governors played the harlot with carpenters.” Jesus is called "Jeschu" which means May his name and memory be blotted out. His Hebrew name is Yeshua, which means Salvation. Sanhedrin 43a says that Jesus the Nazarene was executed because he practiced sorcery.